I have particularly sensitive skin and try to avoid chemicals at all costs. I have mentioned before that I do have issues with pelvic pain and that particular area is something I am VERY careful with. I always read the ingredient list on any product I use and if I don’t like what’s in it, then I won’t use it. I am not alone and at least 43% of women suffer from sexual dysfunction symptoms at least once in their life. What kinds of issues am I talking about? For starters, there is vaginal dryness which can be caused by many things including stress, menopause or even nursing. Lack of arousal is another problem due to lack of natural lubrication. Finally, there is pain during physical intimacy which I can fully relate to. There are many causes of pain and the two that relate to the review are insufficient lubrication or being irritated by lubricants containing petrochemicals/parabens. It is no fun when it hurts to be with the one you love. Its very frustrating and you feel like you are the only one in the world with this problem. But that is not the case! Good Clean Love can help the above issues with their line of healthy lubrication alternatives. Most importantly, they help without the use of harmful chemicals! I am very allergic to propylene glycol and was sooooooo happy to see that none of their products include it. It seemed like that nasty chemical was in just about everything! There is also NO parabens which also have a high yuck factor in my books! I received Cupid’s Travel Kit from Good Clean Love for review. It contains Almost Naked Organic Lubricant, Caribbean Rose Love Oil and Cocoa Mint Body Dessert- its got everything you need for a special Valentine’s day or a weekend away! The Almost Naked Organic Lubricant is one of the cleanest and most natural water-based lubricant on the market. It is infused with real herbs and flowers to create an authentic scent. It is safe for latex and toys and has a non-sticky formula. Without getting into too much detail for my comfort level and your own, I will say that it was very smooth and did the job nicely without being irritating. Big plus that it has no chemicals- that’s the key selling feature for me! The Caribbean Rose Love Oil has a earthy rose scent which is very pleasant. John has a bad back so I used this oil to give him a back massage. I didn’t need to use much of the oil to the job and was happy to see that it lasted a long time. Of course John said it felt great, but it was also good for me and not all that greasy even though it was an oil. It absorbs really well into the skin. It is safe to use all over the body and like the lubricant, has no icky gross chemicals! The Cocoa Mint Body Dessert is soooooo awesome! 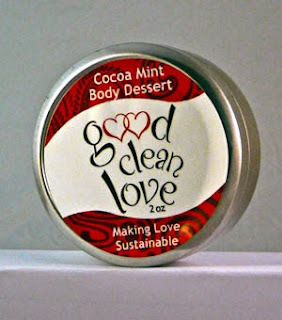 It is an organic body butter blended with organic Egyptian cocoa. It smells like one of my favourite combinations- mint chocolate! You aren’t supposed to use internally and don’t eat it even though it does smell good enough to eat! It leaves your skin feeling very soft and smelling sweet. You can buy these products separately or purchase them in the Cupid’s Travel Kit for $34. They have awesome prices on all their products. 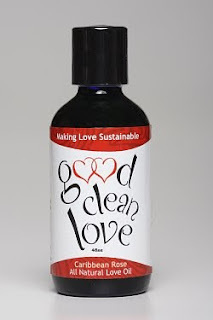 Good prices, natural products…Good Clean Love gets a thumbs up from me!